I was 52 when someone commented that, “it’s nice to have a hobby.” I replied that it is not a hobby, that I consider art to be the same as my husband’s work; it’s my job. That was my first realization that I am an artist. An advertising campaign recognizing national artists with a full page reproduction of Rodrique’s Blue Dog. I blurted out to my husband that, “I can do that.” Stated out loud, I now had to do it. I used pastel to paint an 8x10 copy of that ad; my husband framed that not-so-good painting and hung it in a prominent place in our home. Through the years he has been my constant supporter. My first step as an artist turned out to be the best. Mission Renaissance in Los Angeles gave me sound instruction in the fundamentals of drawing and value, which remain the basis of my painting. Daniel Greene videos, workshops with other pastel artists that I admire, constant study, and many struggling hours of painting round out my background. An artist should create beauty and emotion. My vision is always to paint the reality of a person, candid, unposed, leaving a little mystery. In my portrait and figurative work, I look for a connection or memory between the subject and me, a feeling, and I try to paint that emotion. It usually comes through in the eyes, but sometimes I find it in the gesture of the person. There’s a moment when my hand no longer wants to reach for a color. My eyes scan the painting and accept everything they see. That’s when I know to stop. The artist who first influenced me was Daniel Greene. His method of drawing made sense to me. Although I now try to be a more painterly artist, Greene’s method is still my basis. Mary Cassat and Daniel Greene for figurative work and Bob Rohm for landscapes. Pastel has always been my only medium. It was the first medium I was introduced to and, for its beauty, the only one I have ever tried. Because I liked it, I decided at the beginning to focus on the one medium and get good at it rather than do a little of everything. At this time, I am inspired by the looseness of Alain Picard in figurative work and Barbara Jaenicke in landscapes. I am a quiet zone painter, no music or food. However, I am doing a series of paintings with the composition based on the storyline of classic country/western songs. In those, lines of the song run through my mind while painting. My art has evolved mainly due to the line of sanded papers that are now offered and the different manufacturers of pastel. Sanded papers allow me to build up layers of color and texture, and different pastel manufacturers have created varying degrees of softness and a tremendous range of colors and values not available 10 years ago. My strength is in the use of unexpected color combinations that read true and my weakness is in composition. My favorite painting is Eyes to the Future, the left panel of a triptych. It’s a heart tugger, boys of the Samburu tribe of the Maasai Mara, from a trip to Kenya. If dreams came true, in 5 or 10 years, I would be in an immersion-based atelier, focused only on learning and painting. The best advice comes from my own beginning: Take the time to learn to draw, to get proportions right, “where is this in relation to that.” Learn values. And photograph every painting. What color is your bedroom? A medium neutral that blends with soft warm pinks but works with muted gray-green. What has been your most embarrassing moment? I try to avoid this. Name something you love and why. My handwoven rugs, with their beautiful intricate detail, color and design. What is the one thing you would like to be remembered for? Connecting with people. When my pastels create an emotional connection with the viewer, and a smile, I feel I've made a strong painting; that is my passion. I did not even start painting until my Dad died. I needed a release and chose to learn to paint. I am so glad that I did. I was 28. I have taken workshops and am mostly self-taught. I feel we should give back to people by sharing our art. I create art that inspires me. I paint many different subjects. I don’t know how I would answer this as my being is in everything I create. I feel it is finished when I go over the painting and am satisfied with my painting. I do like many artists and value their opinion. I like Laurie Pace, Rusty Jones, and many other plein art artists. Oh that is very hard. I would love to be compared to Richard Schmid and my friend Ann Hoffpauir. I am hooked on oils and I like the way you can work with it. I have tried acrylics and watercolors but always come back to my oils. I relate to artists who paint realistic and some impressionistic. I listen to Elvis, Rod Stewart, and country music. Has your art evolved or changed in the past ten years? If so, how? What are your strengths and weakness? My works have improved and I am very happy about that. I would love to get better and better. My strengths are, I am not afraid to try bold colors and new subjects, I experiment with colors and limited palettes. I have found that I love to teach classes. My favorite piece of art is a painting I did of my brother and me when we were about 4 and 5. We had outfits I painted us in and I remember so many happy times with my brother. No, I find artistic life soothing. I love the solitude when I am painting, I like people but I am not bored with my own company. When not in my studio, I am with my husband of 51 years and our friends and family. I would probably still be creating and plein air painting, I have been painting for over 37 years and I have never been bored with it. I strive to be better than I am right now. I will never stop learning. Never ever give up. You cannot learn everything in just a few lessons or workshops. "Deer Shadows" 5x7.5 watercolor on Moleskine painted while visiting New Mexico mountains recently. Kristine Byars uses vivid color to create paintings that are often playful, and yet evoke warm emotions. One consistent theme in her art is a great love of nature and all creatures. Horses hold a particularly special place in Kris' heart, and when not painting she can often be found with her quarter horse, Sparky. Kris lives a life surrounded by nature in Texas with her husband Steve, cat, golden retriever, and Sparky. Here is another version of the Noah "Bud" Ogle Cabin, located in The Great Smoky Mountains National Park. Could not resist doing one in fall colors. May eventually do a winter/snow scene and perhaps a summer version of the cabin. Enjoy! An international flower paint-athon in California! Students from Singapore, Australia, Canada, New York, Michigan, Arizona, Alabama, and across the US painting flowers in historic Balboa Park, in the heart of San Diego, California. Tonight we have dinner on Coronado Island, tomorrow morning - gourmet donuts for breakfast - woohoo! Holiday Greetings from the Artists of Texas featured in Visual Language Magazine. This is an inset from some of our artists that is in the December Issue of Visual Language Magazine. Click the magazine to enjoy the art. Even in Texas we often see a white Christmas. People joke and laugh at the thought of longhorns pulling a sleigh over the prairie fields. 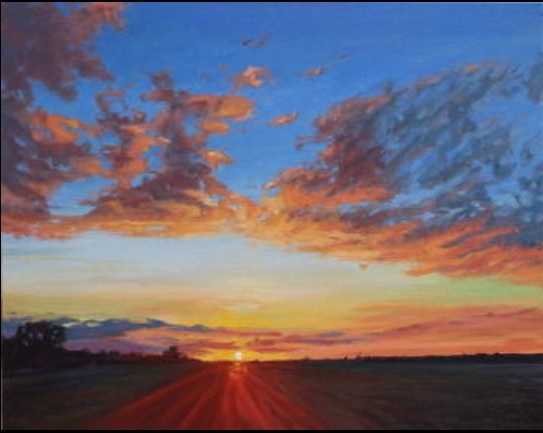 Never the less, the Artists of Texas paint in full living color capturing holiday pieces from deep in the Heart of Texas. Amy Hillenbrand, Barbara Haviland, Barbara Mason, Carolyn Hancock, Cheryl Smith, Debra Latham, Deran Wright, Ed Crumley, James Loveless, Janet Broussard, Joan Eure, Judy Mackey, Judy WIlder Dalton, Kristine Byars, Kristine Kainer, Kyle Wood, Laurie Pace, Leada Wood, Melissa Torres, Nancy Medina, Patsy Lindamood, Rebecca Zook, Roseanne Snyder, Suzy Pal Powell, and Vernita Bridges Hoyt. You can read the full December issue of Visual Language by Visiting the VL website.